March 02, 2015, 8:49 a.m.
On the whole, we like immigrants but not immigration. The key to making sense of public opinion lies in the difference between the way we view the people and the issue. When we think of immigrants as individuals, we often see the way they enhance our neighbourhoods, public services and wider economy. When we think of immigration as an issue, we link it to government failure, economic insecurity and Britain’s decline from greatness. YouGov’s poll demonstrates the contrast vividly. As many as 75 per cent of us think there has been too much immigration in the past ten years. Yet, when people consider specific groups, a more nuanced picture emerges. Few of us think that people who have arrived from Poland, India and the Caribbean have, on balance, had a negative impact on British life. Moreover, when we ask who should be admitted, most voters reject any cutback in the current numbers of immigrants who come to work in the NHS, or study at British universities, or are highly educated, or want to invest in Britain, or are fleeing wars or persecution. Not surprisingly, big majorities of Labour and Liberal Democrat voters share these views. But so do most Tories; and even Ukip voters generally welcome students, investors and the highly educated. So why do so many of us think that immigration is such a huge problem? It’s because the perceived drawbacks weigh more heavily than the often positive personal experiences. Most of us fear that immigrants are flooding into Britain to claim welfare benefits and clog up our schools and hospitals – and 63 per cent of us fear that no party is able to control the numbers coming here. And while most of us are relaxed about individuals who have settled here from many parts of the world, we tend to have a dim view of those who settle here from Romania, Nigeria, Pakistan and Bangladesh. Overall, our poll reveals some key differences between groups. Women, working-class voters and people over 40 are far more hostile to immigration than men, middle-class voters and people under 40. Other YouGov polls have found similar divisions when we ask about the broad direction of British society. Dislike of immigration is strongest among those groups who feel least secure and most pessimistic about the years ahead. 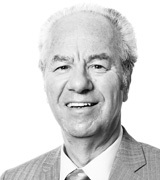 Some people, notably business leaders, warn that any strict curb on immigration would damage prosperity. Most voters simply don’t believe it. Just 21 per cent think lower immigration “would damage the growth and success of British business”; 57 per cent say this is false. Among those who think immigration in recent years has been bad for Britain, a mere four per cent fear economic damage. The one issue that causes the largest number of anti-immigration voters to pause for thought is what might happen to the health service. 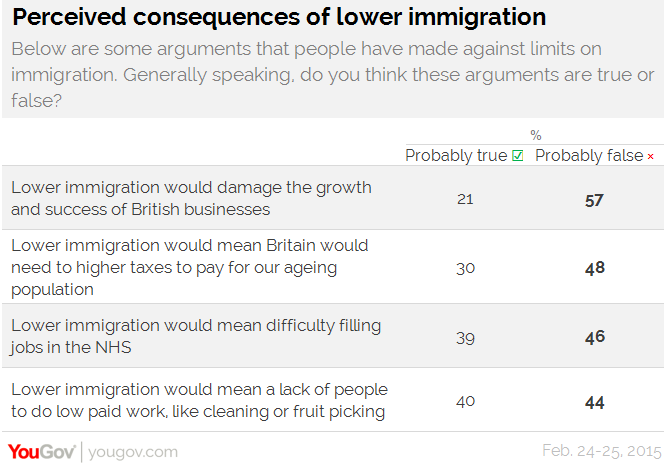 Two in five people fear that “lower immigration would mean difficulty filling jobs in the NHS”. In a way, our perceptions of what goes on in our hospitals capture our ambiguity towards the wider issue. On the one hand, millions of us worry that immigration patients are clogging up the NHS – yet on the other hand we recognise that the NHS needs nurses, doctors and ancillary staff from overseas. Finally, our poll makes clear that, while immigration is a major concern, ethnicity is not. Few of us would be unhappy if someone from a different background moved next door (10 per cent), were our boss at work (7 per cent) or married our son or daughter (16 per cent). One practical consequence of recent levels of immigration is a sharp reduction in the number of us whose close friends are all white, from 50 per cent in 2005, to 37 per cent today. As a nation, we seem to be adjusting to the impact of immigration over the years to our families, friendships, neighbourhoods and offices, even as we deplore the failure of successive governments to keep the numbers down.